7025 valve – Is it equivalent to the ECC83? One question we are often asked is this: Is the ECC83 equivalent to the 7025 valve? The short answer is yes in that you can swap a 7025 valve for an ECC83 and your amplifier will work fine. The 7025 valve is a low hum and low noise version of the ECC83, but whether you’ll hear the difference is debatable. 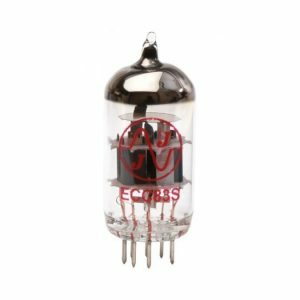 99% of valve amplifier manufacturers use ECC83 (12AX7) as the first preamplifier valve so if it’s good enough for them …. The RCA 7025 Valve is a 9-pin preamplifier valve with two identical triodes both of which have a high voltage gain. It was developed around 1946 by RCA engineers and was released for sale as the 7025 shortly after. Because it provides two handy amplifiers in one miniature glass envelope, the 7025 is still a much used and popular valve. It is one of the few small-signal vacuum tubes in continuous production since it was introduced. We sell the amazing JJ valve range which are guaranteed to give you awesome tone and power. 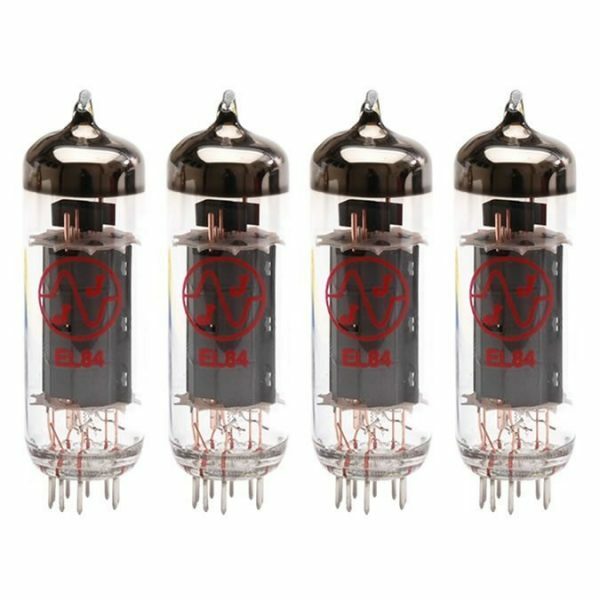 They are a significant upgrade to the valves that come with many amplifiers. You can see our range here. The 7025 Valve – Two Valves in One! The reason the 7025 valve is used so much is because it’s actually two identical valves in one envelope! So designers can get two gain stages using just one 7025 valve. 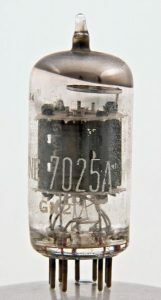 In technical terms, the 7025 valve is a “dual high gain triode”. Let me explain that a little better. ‘High Gain’ – well, that speaks for itself. The gain is about x 100 although in practice a workable gain of 60 is achievable. So on the 7025 (ECC83) valve they put the heaters in series and bring out the two ends and a centre tap. Neat – and only 9 pins. You can put 12V across both heaters, or 6V across the individual heaters and ground the centre tap. The answer is simple. In ‘theory’ you’ll get a bit lower noise and lower hum with a 7025. Otherwise, they are identical. Whether you will actually hear the difference is another matter. If you own a valve guitar amplifier it’s highly likely you’ll have at least one 7025 (ECC83) in it. The preamplifier guitar amplifier valves (e.g. 7025 or ECC83) take the very low-level signal from your guitar and amplify it up in several stages. For reasons I won’t bore you with, you can only get a certain amount of gain from a single valve stage. So you need to cascade several guitar amplifier valves to get the gain we need. This is where it’s very handy to have two separate amplifiers (triodes) in each 7025 (ECC83) envelope. You get two stages of gain for the price of one! Because the 7025 (ECC83) has a lowish current capability, you can’t use it to drive the speakers. For that, you need bigger, beefier power valves. The 7025 (EXCC83) is confined to the early stages of your amplifier where it boosts low-level signals to useable levels. Uses For The 7025 Valve. The RCA7025 (ECC83) is also often used to recover the very low-level signals coming from the reverb pan. Sometimes this is done with a solid state circuit to save costs. A typical valve guitar amplifier will have between 3 and 6 preamplifier valves. These are nearly always ECC83 valves. Occasionally you will find an ECC82 or ECC81 used as a pre-amplifying valve. These are nearly identical to the 7025 (ECC83) but they just have a somewhat lower gain. So now you know. There is little difference between a 7025 valve and an ECC83 (apart from the printing on the side) – you can buy either. We sell JJ ECC83 valves as they offer stunning sound quality and power but they don’t cost a fortune. Interesting and very clear – thanks. BTW – where can I get some of those bugger, beefier power valves?!! I found this explanation of the 7025 & 12ax7 to be the clearest and most understanding ‘thesis’ I have read. Thank you indeed for clearing some technical issues regarding Vacuum tubes for me. Well done! Absolutely not! These are not equivalent members of a family as is often touted, they are totally different valves designed for totally different roles. If you put an ECC81/2 into a circuit designed properly for an ECC83 everything will change, DC levels, bandwidth, load resistance, gain (which has a limited dependency on the valve’s Gain Factor which is not the same thing as Gain in a circuit). It is an industry myth that they are swappable without consequence. Thanks Albie I have updated the blog to reflect your input.